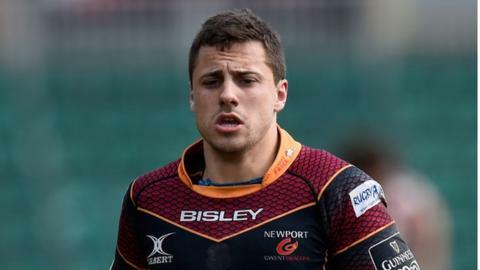 Newport Gwent Dragons snatched a shock win at Gloucester to reach the semi-finals of the European Challenge Cup. Scrum-half Charlie Davies grabbed a close-range try after 76 minutes to put the holders out and and their 15-game unbeaten European run. Dragons fly-half Dorian Jones kicked five penalties and Carl Meyer one in a close-fought game. England back-rower Ben Morgan and Steve McColl scored home tries while Greig Laidlaw kicked 11 points. Gloucester: Tom Marshall; Rob Cook, Henry Trinder, Mark Atkinson, Stevie McColl; James Hook, Greig Laidlaw (capt); Paddy McAllister, Richard Hibbard, John Afoa, Tom Savage, Mariano Galarza, Sione Kalafamoni, Matt Kvesic, Ben Morgan. Replacements: Darren Dawiduik, Yann Thomas, Paul Doran-Jones, Elliot Stooke, Gareth Evans, Callum Braley, Ollie Thorley, Jacob Rowan. Dragons: Carl Meyer; Adam Hughes, Tyler Morgan, Adam Warren, Hallam Amos; Dorian Jones, Sarel Pretorius; Phil Price, Elliot Dee, Brok Harris, Rynard Landman, Nick Crosswell, Lewis Evans (capt), Nic Cudd, Taulupe Faletau. Replacements: Rhys Buckley, Boris Stankovich, Shaun Knight, Matthew Screech, Ed Jackson, Charlie Davies, Angus O'Brien, Geraint Rhys Jones.